Celebrity Assistant and Bestselling Author, Bonnie Low Kramen, is launching a nationwide anti-workplace bullying campaign, following the release of a survey which highlights the rife epidemic of bullying at work, and the emotional damage which is costing businesses millions of dollars per year through employee retention, absenteeism and decreased staff productivity as a direct result of work-related stress. Bonnie Low Kramen will host the launch campaign in Washington DC, examining workplace bullying with a live audience, alongside former Director of Events at the White House and Special Assistant to Bill Clinton – Laura Schwartz, and Microsoft certified trainer to Bill Gates’ Administrative team – Vickie Sokol Evans, who will also take to the stage during the inaugural international conference for office professionals, at the Watergate Hotel, November 10-11. 69 percent of those surveyed had personally experienced workplace bullying during their career, with 67 percent of those bullied having experienced bullying in the workplace on 3 or more occasions; 82 percent of those who had experienced bullying in the workplace has suffered severe stress as a direct result of the situation; 84 percent noted that their productivity level had dropped during the time; 43 percent of those surveyed, had taken time off work sick, varying between less than a week, between one week and one month, right up to more than 6 months away from the workplace. In monetary terms, workplace bullying results in over $16million in turnover and $8million in lost productivity per year. While this is evidently creating a dent in the financial turnover of companies, the real damage is much more serious, with employees facing ongoing trauma, emotional symptoms and medical conditions. The physical and mental effects caused by bullying in the workplace resulted in 92 percent of those surveyed, not wanting to return to the office, 87 percent experiencing anxiety and depression and 61 percent maintaining difficulty concentrating. Shockingly, the results show that businesses are not taking appropriate action to prevent workplace bullying and protect staff members. Results showed 83 percent of companies that were aware of the situation did not consult with HR, with only 7 percent taking disciplinary action, and 84 percent providing no professional support to victims. Bonnie Low Kramen commented: “This global epidemic is real, and it is time to take action and the price we are paying is far too high. Businesses are losing staff, productivity and hemorrhaging money to pay absenteeism, recruitment and lawsuits. But more importantly, we have an unhealthy working culture which will only change by shining a light and training our leaders how to take action. I cannot believe that we, in the US, are yet to pass a bill in any single state to protect employees from workplace bullying, given that this issue has been the elephant in the room for years. 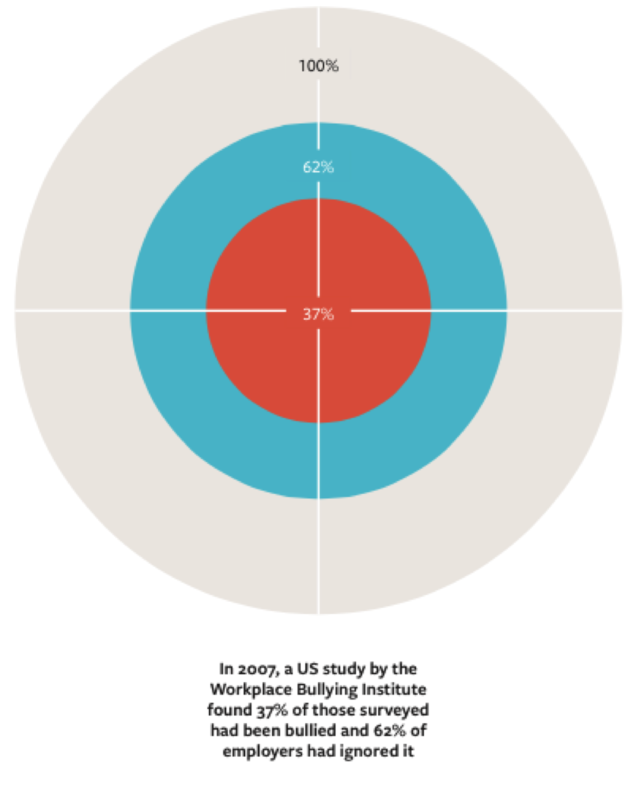 In spite of the visible costs to companies, 25 percent of respondents identified their company as having no official policy or code of conduct when it came to handling bullying, while 44 percent felt their company HR department dealt with bullying inadequately, and 8 percent outlined their company had no formal HR department or personnel. Bullying is a sensitive area and can be daunting and sometimes difficult to handle. One of my employees says she is being bullied by her manager. I understand that the company dignity and respect policy should be followed and I want to ensure the process is undertaken correctly. How should I proceed? The purpose of such a policy is to ensure a working environment free from bullying and harassment. It should apply both at work and at work-related events such as meetings, conferences and office parties, whether on or off the premises. The policy should also apply to customers or other business contacts. Bullying is a sensitive area and can be daunting and sometimes difficult to handle. You should listen patiently, be supportive and discuss the options open to the employee. Assure her the policy is in place for her protection and the company takes such allegations very seriously. It is important that you remain impartial, because at this stage there is only an allegation, and both parties are entitled to a fair hearing. The policy should have informal and formal procedures to deal with such issues. Any employee who complains about bullying or harassment should have the option of which procedure they wish to follow. In this case your first step is to speak with the employee, to outline both procedures. It is often preferable for all concerned that complaints are dealt with informally whenever possible, as an informal approach can often resolve matters quickly and effectively with the minimum of conflict and stress. Mediation could also be an option under the informal procedure, when a trained mediator arranges a meeting with both parties, if they agree. This option is particularly effective where personality conflicts are the core of the problem. This procedure must be open and transparent, with confidentiality a key factor. The Labour Relations Commission Code of Practice on bullying in the workplace defines bullying as “Repeated inappropriate behaviour, direct or indirect, whether verbal, physical or otherwise, conducted by one or more persons against another or others, at the place of work and/or in the course of employment, which could reasonably be regarded as undermining the individual’s right to dignity at work. An isolated incident of the behaviour described in this definition may be an affront to dignity at work but, as a one-off incident, is not considered to be bullying”. Ensuring positive moral and employee relations after the investigation is important, to ensure both parties can work together as the business requires. Open communication and possible mediation at this stage is key in that regard. We all want to work in an environment that respects the dignity and work of all. Fostering a culture in which unacceptable behaviour is nipped in the bud immediately by all stakeholders is a key ingredient in promoting this culture. BILLIONS of pounds is lost from the engineering sector every year due to homophobia and outdated attitudes, new research has shown. The macho culture of some firms forces people to remain ‘in the closet’ over their sexuality and a lack of ease in the workplace has been a barrier to career progression. Bullying and pressure on lesbian, gay, bisexual and transgender (LGBT) engineers means £11.2bn fails to materialise within the engineering economy a year due to lack of productivity and people feeling locked out of the industry. The investigation commissioned by ex-mechanical engineer and Yorkshire MP Alec Shelbrooke and authored by Dr Mark McBride-Wright aims to show how the industry can make significant changes. They would like to see all engineering firms adopting diversity and inclusion policies and ensure that boards are taking the issue seroiusly. He said that while homophobia within the construction industry is well documented, little is known about its place within engineering, despite 5.4m people employed in the sector across the UK. Only 46 per cent of gay engineers surveyed said they would be comfortable being out about their sexuality in the workplace, and 53 per cent said that they were not open about their sexuality at work, or were ‘closeted’. The international nature of engineering work means that many also have to struggle with homophobic laws abroad, particularly in Africa and the Middle East. The survey also showed that 33% of gay engineers said they felt their sexuality had acted as a barrier to career progression. Former Chief Executive of BP, Lord Browne of Madingley, who is backing the report, said: “As a graduate trainee engineer at BP in the 1960s, it was immediately obvious to me that being gay in business, and most definitely in the oil business, was unacceptable. Even as chief executive of BP in the 21st century, I was worried coming out of the closet would damage critical business relationships. Engineering firms and the Government are now being called-to-arms to address inclusion, as so far only employers BP, EDF Energy, and the Armed Forces feature in the leading LGBT rights charity Stonewall’s 2015 Workplace Equality Index. Recommendations include establishing a diversity and inclusion policy, flexible policies for those working overseas and training in unconscious bias. Dr McBride-Wright, who works for industry LGBT network group InterEngineering, said: “Progress and acceptance within the workplace for those in the LGBT community is hindered by homophobic, biphobic and transphobic language, both in the office and on site. Mr Shelbrooke added: “The basis of this report is to recommend that homophobic attitudes can be transformed through proactive, educational teamwork and leadership. Q: I have received reports that one of my employees has experienced bullying in the workplace. While I have not witnessed this personally, I want to ensure the situation is dealt with appropriately. Please could you advise on the correct protocols to follow? A: It is fundamental that employers are aware of how to deal with allegations of bullying effectively in order to avoid negative consequences. The Advisory, Conciliation and Arbitration Service has recently published figures that show they have received 20,000 calls from employees who are experiencing bullying at work therefore it appears a prevalent current issue. It may be possible for allegations of bullying to be resolved informally. You should approach the employee with a sympathetic ear and ask generally if everything is okay. If they are not forthcoming with information about the bullying, you can introduce it to the conversation by telling them that there are routes available through which any problems they have can be addressed, and that they should not suffer in silence. If they feel able, they maybe able to stop the bullying behaviour themselves by speaking directly to the individuals, or they may require assistance from other workplace personnel. Some individuals may be unaware that their behaviour is causing offence to others and once informed any ill behaviour may stop. If the employee would like the situation to be dealt with through a more formal route, or the informal route has not been successful, or is not deemed appropriate, then more formal procedures should be implemented using the organisation’s grievance procedure or personal harassment procedure. This will include holding a formal meeting with the employee so that you can gain much more detailed information about the alleged bullying, including names, dates and any witnesses present. You will then need to undertake a thorough investigation, including speaking to the alleged bully in an investigatory discussion. It is important to remember that investigations regarding bullying should take place both quickly and impartially. Any investigation must be objective and all factors should be considered that is, harassment being felt differently by different individuals. 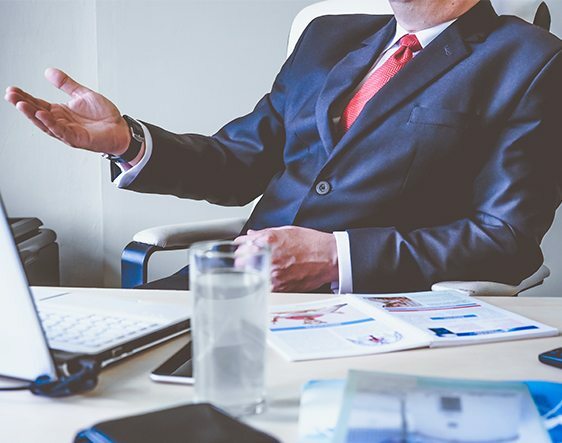 It is not considered a breach of confidence to interview an alleged bully and indeed many policies on bullying or personal harassment within organisations include this step specifically. It could not be a rounded or a full investigation if the alleged bully is not spoken to as part of the investigation. Your decision on whether the grievance can be upheld or not, that is, whether you can, from the available information, ascertain that the employee has suffered from bullying, should be conveyed to the employee. If the grievance is upheld, this may mean the consideration of some action taken against the perpetrator(s) in accordance with your disciplinary procedure. In all walks of life, there is the potential to be exposed to bullying. It is unacceptable anywhere. But it is especially insidious in the workplace, as this is where a person earns their livelihood. In the health service, recent studies suggest a certain culture of bullying that is also driving some health staff abroad to work. But it’s even more serious, writes Health Correspondent Fergal Bowers. If bullying in the health service results in some staff not reporting concerns about the working environment and patient care, or not highlighting mistakes that have occurred, that should be of great concern to everyone? Stephen McMahon, of the Irish Patients’ Association, said that the problem with bullying is that people are afraid to speak up. The threat is that a person may lose their job, or promotional prospects. The IPA says it is aware of several cases, including where a resident in a nursing home who alleges they were told that if they contacted the Health Information and Quality Authority, they would end up on the street. In another case, a service provider lost their job working for a company when they made a complaint (whistleblew) about a client hospital. Mr McMahon said that it is a responsibility of employers, institutions and society, to ensure that ordinary people, everywhere, at every age and whatever their occupation are protected from bullies. Who does the bullying – managers, doctors, nurses? The Health Service Executive says it does not have centralised data for allegations of bullying. It said that many complaints are successfully resolved at local level, without recourse to formal investigation. The HSE said it recognises the right of health service staff to be treated with dignity and respect. It said it is fully committed to ensuring that all employees are provided with a safe, working environment, which is free from all forms of bullying. There is a national ‘Dignity at Work Policy for the Health Service’. The HSE says it recognises that a culture of bullying and harassment, if unaddressed, undermines employee motivation and morale and adversely affects the quality of patient care. The Medical Council did a survey recently which has some worrying findings. It showed the prevalence of bullying in the training environment for doctors and that it has a notable impact on doctors leaving the country to work elsewhere. There was a significant link between trainees’ staying intentions and their experience of being undermined by a fellow consultant, or a GP in their working area. Trainees who were frequently undermined in their post (34%) were significantly more likely to intend to leave medical practice in Ireland, than trainees who were never undermined. The Irish Medical Organisation says it is “wholly opposed to bullying”. Dr John Duddy, the union’s vice-president and chairperson of its Non Consultant Hospital Doctor Committee, says the IMO has dealt with a very small number of complaints over the years in relation to bullying issues from its members. But he says the union is concerned that there is a level of under-reporting and a culture of just “getting on with it”. Dr Duddy strongly encourages anyone experiencing bullying, to avail of the internal structures to deal with such issues and to seek assistance from the union. He says there is no substantive data as to whether the level of bullying among medical trainees, is any greater than the level among other grades or professions within the health service, or the workforce generally. Any form of bullying is inconsistent with a positive working experience. At the IMO’s AGM in 2014, it passed a motion condemning bullying in the health service. The health effects of bullying can be physical and psychological. Those affected may experience anxiety, increased stress, panic attacks, a lack of sleep, higher blood pressure, ulcers and depression. Is bullying professional misconduct for doctors and other professions? The Medical Council which polices doctors’ behaviour says it would depend on the seriousness of the allegation and whether the allegations affect a doctor’s fitness to practise medicine. The Council’s annual report for 2014 contains some figures on complaints in relation to ‘reporting concerns about colleagues’ and ‘professional relationships about colleagues’ which it says would be the closest categories to bullying. The number of complaints in 2014 was 12 and 18 the previous year. Bill Prasifka, the Chief Executive of the Medical Council, says the data on bullying in the medical profession has been a matter of concern for the Council, since the first Your Training Counts report published last year. He says it raises concerns about the quality of life and wellbeing of doctors, with the associated link with poorer health and wellbeing for those experiencing bullying. The Council says it is working with all parties involved in medical education to deal with the issue. In April, the Irish Nurses and Midwives’ Organisation published a large scale survey of the current levels of workplace bullying. The study was in partnership with NUI Galway and the National College of Ireland. It found that over the last four years, there has been an increase of over 13% in perceived incidences of bullying. Almost 6% of respondents reported that they are bullied on an almost daily basis. The percentage of non-union members who experience almost daily bullying was almost double that of union members. The study found that Government cutbacks were a probable explanation for the significant rise in reported bullying between 2010 and 2014. They may also explain the level of absenteeism, or illness among staff, in certain areas of the health service. Most large organisations have anti-bullying policies in place but what about implementation? A zero tolerance policy of bullying should exist and it should apply to all levels of staff. The advice to anyone experiencing bullying is to stay calm and walk away, document any incidence, follow bullying procedures and seek support. This is not just an Irish problem. It was raised recently at the European Junior Doctors Group. Its president, Carsten Mohrhardt told RTÉ News that workplace bullying and stress are factors in doctors emigrating. The organisation says it is totally opposed to workplace bullying and is committed to tackling the issue in hospitals and healthcare centres throughout Europe. The EJD says that national government and healthcare authorities should take all reasonable steps within their power to address this issue within the healthcare sector. Bullying is one of those problems that can often remain hidden. Yet usually when bullies are exposed, they are defeated. Earlier this year, the Good Governance Institute was commissioned to consider and investigate how the NHS carries out reviews of bullying and harassment under the Dignity at Work Policy. This was following allegations of bullying and harassment at Worcestershire Acute Hospitals NHS Trust. The investigation concluded that The Dignity at Work Policy was ‘not fit for purpose’. The report found “insufficient evidence to conclude that bullying and harassment is endemic at the Trust”. Although the report did find an “inconsistent and confusing” approach to the way staff concerns were addressed. Additionally the report stated that there was confusion about the definition of bullying. Culture refers to the implicit standards and values that underpin an organization. However, the culture of many healthcare organizations is permeated with fear. This negatively affects doctors as well as healthcare co-workers at all levels. It is increasingly difficult for doctors to deliver quality care; nerves are frayed and tempers short. Patients feel compromised, anxious, and overlooked; they look to doctors for solutions. In consequence doctors are experiencing unacceptable levels of mental and physical stress. The Fear-Free Organization book presents Neuroscientific research that shows the damaging effect fear has on the brain. In common with all mammals, human beings have evolved with eight basic emotions hard-wired into the brain. Fear, anger, disgust, shame and sadness are the flight/fight/fright/freeze emotions related to escape/avoidance; they prepare us to deal with danger. Love/trust and joy/excitement are the two emotions to do attachment and belonging. Surprise can take us in the direction of either escape/avoidance or attachment. Excessive and persistent levels of fear create changes in the brain. These changes then interfere with the ability to work, to make decisions and to think with clarity and purpose. Lord Darzi’s 2008 report concluded there that was a ‘pervasive culture of fear in the NHS’ that directly links to bullying and the failure of staff to speak out and report instances of bullying. A 2015 NHS staff survey showed that 24 per cent of staff said that they had been subject to bullying, with 3 per cent of staff saying they had suffered physical violence from managers or colleagues. According to the British Medical Association (BMA) hospital doctors are worried about being ‘bullied and harassed’ when raising concerns about patient safety. In a study conducted at hospitals throughout Wales 60% reported raising concerns; 60% of those doctors reported instances of bullying or harassment as a direct result of raising concerns; of those 60%, 40% reported that no action had been taken. The report further stated that underpinning the bullying and harassment of doctors were pressures resulting from unfilled staff vacancies; pressure to work longer hours, the drive to meet targets and having to work in inadequate facilities. A culture of fear is the perfect breeding ground for bullying behaviour. Bullying and harassment cause anguish; they wreck lives, and destroy the fabric of an organization. The antidote to fear is quite simple – trust. Although building that trust is more difficult, and can only be born from creating and maintaining good relationships. Strong teams working towards a common goal create a defence against fear and encourages everyone to feel like they are ‘in it together’. Good relationships involve honest and open communication and this is particularly important in healthcare when people are being cared for and lives are on the line. However, it is up to leaders to take note, to realise the importance of eradicating fear in the workplace and follow through on stated policies of zero tolerance of bullying to ensure a fear-free organization is produced. The Australian Public Service (APS) is seeing costs go up when it comes to both physical and psychological injuries, with departments continuing to seek an end to expensive compensation claims and sick leave. According to a recent APS Commission update, the incident rate of psychological injuries is now higher in the public sector than in the private sector. Fairfax Media reported that departments were also told in the update that they could be doing a better job of supporting the mental health and wellbeing of their employees. Department secretaries are continuing to assess how workplace practices are affecting staff attitudes, motivation and performance. “This aspect of workplace health and safety links the demands of an employee’s role and the sense of control they experience over how they do their work,” the APS report said. The update found one-third of public servants believe they always or often face unrealistic time pressures at work, while 40 per cent said they never or rarely did. According to Fairfax, trauma from workplace bullying or violence now makes up the largest proportion of mental-stress compensation claims among public servants. The APS update reported that a third of public servants believed they always or often felt unrealistic time pressures at work, while almost half said senior leaders affected their health and safety at work. Just over 40% said their immediate supervisors had demonstrated a commitment to safety – but 20% strongly disagreed with this. “Senior leaders have a profound effect on workplace safety,” the update read. Earlier this year, the Public Service Commission told an inquiry into the reform of the Comcare system that the APS could no longer afford the costs being incurred by the abuse of the scheme. In the update, the Public Service Commission called upon all departments to ensure staff have a means through which to raise concerns about mental health risks, and to ensure that these could be received by management. It was also recommended that senior leaders promote mental health through the introduction of awareness programs and workshops. As the rise of career-killing bullies continues, Professional Manager looks at what drives these oppressors and how organisations can act to stop them in their tracks. When Kate* took her first university job after a stint at Harvard and completing her PhD in record time, she had no idea her boss would crush her dreams of a glittering academic career. Nor did Alex* expect that the arrival of a new line manager would sever his nine successful years at a global market research company. Similarly, Anna* never thought that collaborating with a colleague would lead to months of misery and her progression at their not-for-profit organisation blocked. Meet the victims of hidden bullies at work. All three had exemplary professional track records, yet were made to feel worthless and incompetent by bullies who destroyed their self-confidence and ultimately wrecked their careers. To make matters worse, their respective organisations did nothing to stop it, leaving the bullies free to strike again. Bullying is rife in the workplace. Ask anyone you know, and the chances are they have been bullied at work or have a friend who has. This shocking trend is on the rise, according to Dr Sheila Keegan, business consultant and chartered psychologist, in her latest book The Psychology of Fear in Organizations. In 2007, a US study by the Workplace Bullying Institute found that 37% of those surveyed claimed to have been bullied at work and 62% of firms had done nothing about it. Since then, there’s been a steady growth in workplace bullying allegations, says Keegan, who suggests pressure on managers to meet performance targets in the post-recession climate is one reason for the increase. But what is bullying? The UK Advisory, Conciliation and Arbitration Service (Acas) defines bullying as “offensive, intimidating, malicious or insulting behaviour, an abuse or misuse of power through means that undermine, humiliate, denigrate or injure the recipient”. Such behaviour, Keegan says, may be persistent or occasional, and comes in many forms. In Alex’s case, he was repeatedly told he was incompetent because he was unable to achieve the impossible targets his new manager set him. Over a period of months, Kate’s boss told her she was a “disappointment”, but without giving clear instructions about her job. Anna, meanwhile, was undermined, criticised and ridiculed through subtle asides and endless emails. Whatever the tactics, bullying can have catastrophic consequences: chronic stress, high blood pressure and increased risk of coronary heart disease have all been cited by medical research, according to Keegan. And victims can suffer long-term, sometimes permanent, psychological impairment. Other experts agree. Almost two years after he was bullied at work, Alex is receiving counselling for anxiety. Meanwhile, 10 years on, Kate still suffers from writer’s block and impaired confidence. Anna, after three years, has bouts of insomnia and feels unable to progress at work. So the effects of bullying are devastating, yet workplace bullies consistently get away with it. How? Because bullying is so often a subjective experience, it can be difficult in some cases to identify and prove. “Bullying is a pattern of behaviour – repeated actions and practices – so it’s not easy to diagnose and verify, and there is often no smoking gun,” says Professor Kevin Morrell of the Warwick Business School. “Plus, sometimes an accusation of bullying can itself be bullying; sometimes people use disciplinary procedures as a tool in their armoury. 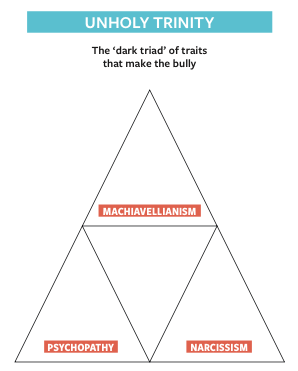 There is a ‘dark triad’ of personality traits, says Morrell – narcissism, Machiavellianism and psychopathy (see graphic, left) – that make it harder to identify bullies. He explains that the narcissist is puffed up on wave of entitlement and ego, which is problematic if you work for them because they won’t want anyone to challenge their idealised self-image. Yet the narcissist’s boss, who doesn’t have daily contact, may be taken in by them, and never see the mask slip, instead rewarding them for being a good frontman – or woman – for the organisation. “Machiavellian employers”, he says, “treat people in a cold and manipulative way. If you are working for someone with those traits, they will treat you like an object. But, if you are the boss of that person, they might seem to be getting great results because they are not pussyfooting around. As well as individuals, bullying can also damage an organisation. Keegan cites research that stresses the importance of naming what is happening as ‘workplace bullying’, as well as providing information to those who are being bullied. If these strategies don’t work, sacking the bully is the only viable option. Morrell suggests an organisation that is serious about rooting out bullies could use exit interviews more effectively. One major media company, concerned about high staff turnover in one department, hired a journalist to rewrite the exit interview questions so departing staff were unable to give the usual platitudes. In came probing questions like ‘name three things you didn’t like about working here’. A bully was unmasked, sacked, and staff turnover returned to normal. Companies could also make it clear to employees that filing a bullying complaint won’t be a traumatic experience. And they could put systems in place to make it easier for people to move departments, similar to a no-fault divorce. However, the bottom line, as Keegan points out, is to create a supportive work environment where bullying cannot thrive. Bullying is more likely to be prevalent in organisations where generalised fear is rife, she says. In organisations where people feel supported and more confident, bullying tends to be less tolerated. “At the most basic level, organisation health is a human right,” says Keegan. “How can it be acceptable to create fear in a workplace, or not try to prevent or reduce it where it does occur? Keegan’s view is that reducing excessive fear at work is a must and needs to be addressed through a variety of means, including strong and fair management, coaching, good leadership, the principles of positive psychology, and different approaches, such as appreciative enquiry and collaborative working. Media reactions to celebrity dermatologist Dr. Fredric Brandt’s tragic suicide may have created an unintentional OPPORTUNITY to bring the issue of adult bullying into the spotlight. CELEBRITIES often provide the inspiration for many parodies, which could be considered borderline bullying — but that’s another story. Although it is not likely that Brandt actually committed suicide as a result , such parodies may not help the self-esteem of celebrities who may be suffering from MENTAL HEALTH issues such as depression. The question arises, is adult bullying actually an issue for us common folk, not just something celebrities have to DEAL with? It certainly is a common issue. In fact, PBS ADDRESSES adult bullying in its series “This Emotional Life.” It focuses on the workplace as being a common place where bullying may occur. “Different from constructive criticism or conflict, bullying is persistent, it focuses on a person rather than a task, and the recipient feels powerless to stop it,” according to the PBS website. Charmaine Hammond, a professional speaker and author, said in AN EMAIL that she works as a consultant and workplace facilitator. She often provides training and intervention regarding workplace bullying, conflict and harassment. “I define bullying as repeated and intentional acts of verbal, physical, social or psychological behaviour that is harmful to another person ,” she said. Although Hammond thinks that there are some differences between childhood and adult bullying, they are still quite similar. Women also tend to be less physically aggressive when involved in acts of bullying in professional SETTINGS like the workplace, she added. Savage said that WOMEN may use other tactics more than men, such as gossip, taunting, shunning, ignoring and excluding. They may also spread rumors, tell secrets, and use more dramatic motions such as eye-rolling, pointing, giggling and whispering. Cyberbullying is also very popular. As a former mediator and conflict resolution expert, Hammond knows firsthand that bullying does not just happen to children. “I believe that there is increasing awareness about bullying and harassment, and I see more businesses and organizations INVESTING in training and appropriate interventions to create safe, respectful workplaces, which is a very positive shift,” Hammond said. 1) Spreading malicious and harmful rumors, gossip and innuendos that aren’t true. 2) Using intimidation, physical threats, yelling or profanity. 3) MAKING hurtful and offensive jokes. 4) Sabotaging someone by SET impossible deadlines that will guarantee failure. 5) Undermining or deliberately impeding another person’s work. 6) Withholding important information, or deliberately providing the wrong information. 7) Using technology to do any of the above , including via email, texting and SOCIAL media. So adults can just brush all of this off, right? In some cases maybe. At the very least, bullying can cause stress, Hammond said. Bullying can actually be quite harmful in many cases, especially because it often goes unreported. Savage added that bullying may lead to anger, frustration, anxiety, depression, and tension. Someone being bullied can experience feelings of helplessness and vulnerability, and a loss of confidence. They can have headaches and stomach pain, as WELL as issues with their sleep, concentration and appetite. Bullying may also lead to REDUCED productivity and low morale, Savage added. So how can adult bullying be brought to an end? In the workplace, a good place to START is making sure there are clear policies regarding bullying, harassment and unacceptable behaviors, Hammond said. Training should be provided to all employees, and they should know how to report a case of bullying and how to respond, she added. It would also be helpful to provide training in conflict resolution, and giving and RECEIVING proper feedback. In some cases, you may be able to confront a bully in the workplace and explain how their behavior is hurtful and negatively affecting others, and they may actually stop if they didn’t realize this before. Sadly this is often not the case. This is why the issue of bullying needs to be brought to light and dealt with MORE effectively.